You can rent a car in Prague at any one of five Sixt locations. These are conveniently located at main transportation centers and at some of the best-known tourist areas of the city. Visitors arriving by air will find us at Vaclav Havel Prague Airport, while those arriving by rail will find a branch at Prague Main Train Station. We also offer car rental in Prague at Florenc Bus Station and at the popular visitor areas of Wenceslas Square and the Old Town Square. At each of our branches you choose from our extensive fleet of premium rental cars. For more information on the car rental services available at each branch simply scroll through our drop down menu. Here you will find the branch addresses, opening hours and car categories on offer at each location. The right hand tab will open an overview of all our locations on Google Maps, providing you a better idea of where our Sixt rent a car Prague branches are. 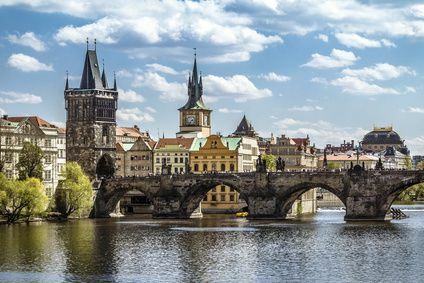 Pick which location works best for your plans, making note of the maximum flexibility offered by the 24 hour rental vehicle returns at our Prague airport branch. Booking easily online, but please remember reservations are only guaranteed for the selected car category as specific models are subject to availability. If you are planning a weekend break in Prague, you can add a little excitement and glamor to your visit by renting one of our sports cars or convertibles. A luxury Audi, BMW or Mercedes-Benz sedan will transport you in the utmost comfort, while a powerful SUV is a great choice if you are planning to explore the country roads around the city. A compact model, meanwhile, is perfect for city trips and you even rent a van or truck from some of our Prague car rental locations. On our booking page you can browse our top quality selection and make a quick price comparison of the models on offer during your rental period. To enhance your car rental in Prague we offer a number of services such as free cancellation and unlimited mileage. You can include useful add-ons to your rent a car for an optimal drive. Insurance coverage options including personal accident protection and tire and windscreen cover can give you more peace of mind. An additional driver allows you to share the wheel and a GPS can keep you on the right track. Skiers can specify a ski rack and snow chains, and a range of child seats are available so you can travel lighter and leave yours at home. If you are flying in to Vaclav Havel Prague Airport, the city center is just 12 miles east on Route 7 and Evropska. The drive will take you around 37 minutes. Driving via the D0 is 18 miles but will usually cut a few minutes off your journey. This route does have tolls, though. Prague Main Railway Station is just over a mile from the city center via Wilsonova or Italska and the drive should take you around 10 minutes. Driving the 2 miles from Florenc Bus station into the city center will take around 15 minutes, also using Wilsonova or Italska. 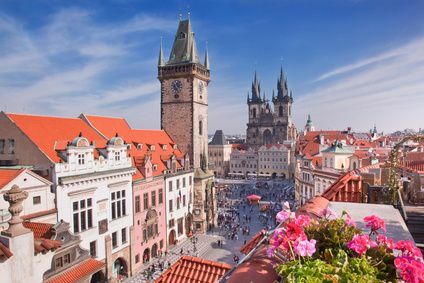 Prague is at the center of an extensive central European road network and makes a great base to explore in your rental vehicle. One of the busiest routes is the D1/E50/E65 southeastern highway, which runs to Slovakia and Bratislava. The D5/E50 southwestern highway takes you to Plzen and Germany and the R6/E48 western expressway goes to Cheb. The D8/E55 highway to the north will take you to the major German cities of Berlin, Dresden and Leipzig, while the D11/E67 runs east to Poland. Remember that to use these major highways you need a pass called a vignette. You can buy these at post offices and gas stations and you need to display them inside your windscreen to avoid a police fine. There are many park and ride parking lots dotted around the city close to the major highways. Orange and green parking bays designate on-street parking in the city but avoid the blue resident only bays. Prague has many famous sites including Prague Castle, which towers above the Old Town offering great views of the city. Here you can visit museums and palaces and watch the changing of the guard every hour. The statues of Charles Bridge are another must-see and the many street artists and musicians add to the atmosphere. Visit the Old Town, or Stare Mesto, to see the Tyn Church and Astronomical Clock. Josefov is the Jewish Quarter and has many ancient synagogues along with Franz Kafka's house. Wenceslas Square is at the heart of the New Town (which actually dates from the 14th century) and is the place to go for nightclubs, restaurants and shopping. For a fine example of modern architecture, check out the stunning Prague Dancing House, designed by Frank Gehry and Vlado Milunic. The city has innumerable museums and countless atmospheric bars serving some of the best beer in the world. 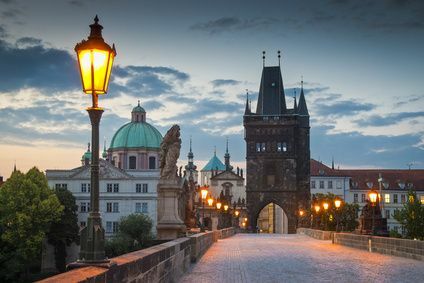 If castles are your thing, you are in for a treat as the area around Prague has some of the most impressive anywhere in Europe. 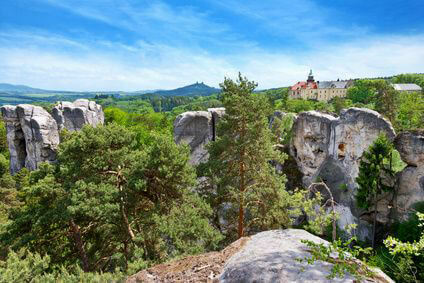 Take your car southwest on the D0 or Route 101 to Karlstejn Castle. Dating from 1348, the castle was founded by King of Bohemia and Holy Roman Emperor, Charles IV. After your visit you can stroll in the pretty village of Karlstejn below the castle. Another stunning castle is the impregnable Ceský Sternberk, just over 30 miles to the southeast of Prague on the E50 and easily reached when you rent a car. The castle perches on a rocky outcrop above the west bank of the River Sazava. Built in the middle of the 13th century, it is considered to be one of the finest examples of Gothic Bohemian castles and, incredibly, it is still owned by members of the same family who built it almost 800 years ago. Prague is the most important city in the Central European economy with an extensive industrial sector and growing financial and services sector. Industries include manufacturing, engineering, IT, financial services and pharmaceuticals. In May 2016 it was announced that Zaha Hadid was to design a new Central Business District for the City around the Masaryk railway station. 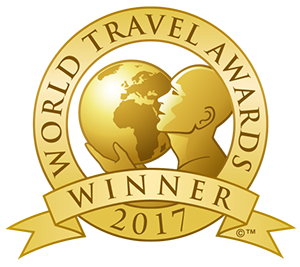 The Prague Congress Centre is now rated as one of the best business event venues in the world.